The complex Japanese lacquering technique known as maki-e is often found on luxury pens, but only a few companies have applied it to watch dials. Nevertheless, this year Vacheron Constantin, Van Cleef & Arpels and Chopard have all teamed up with Japanese maki-e masters to release limited-edition watches. Maki-e, which translates as “sprinkled picture,” is a traditional multilayered lacquering method in which fine colored or precious metal dust, often silver and gold, is sprinkled to form a design or picture on a lacquer surface while it is still wet. This decorative technique uses a rare varnish-tree lacquer that acts as a protective, clear glue between each successive layer, giving the finished scene depth and perspective. Zohiko, based in Kyoto, is a 300-year-old maker of fine lacquer ware that collaborated with Vacheron Constantin to create its first lacquer collection. The process included the application of urushi, the name of the clear lacquer used in maki-e, and yakituke, a hot lacquering process. “Painting urushi onto the metal directly is difficult, so we’ve used the technique called yakituke,” said Nishimura Hikobei, director of Zohiko. The lacquer collection, “The Three Friends of Winter,” is a limited edition set of three watches, decorated with pine tree, bamboo, and plum tree designs, all symbolizing longevity and loyal friendship in the face of adversity. Each watch has a double face, lacquered using the maki-e technique. The main design of the tree on the front of the watch is matched by a bird design on the back, facing the wrist. The pine is matched with a crane, the bamboo with a sparrow, and the plum tree with a nightingale. Christian Selmoni, artistic director at Vacheron Constantin, said all of the first year’s 20 sets were reserved by clients around the world after the collection was introduced in January. Each set sells in Singapore for 435,000 Singapore dollars, or about $330,000. While watchmakers have been using enameling techniques like cloisonné and champlevé on their dials to great effect for decades, they have largely stayed clear of lacquer until fairly recently. This year, Chopard introduced its first “L.U.C. XP Urushi” collection. 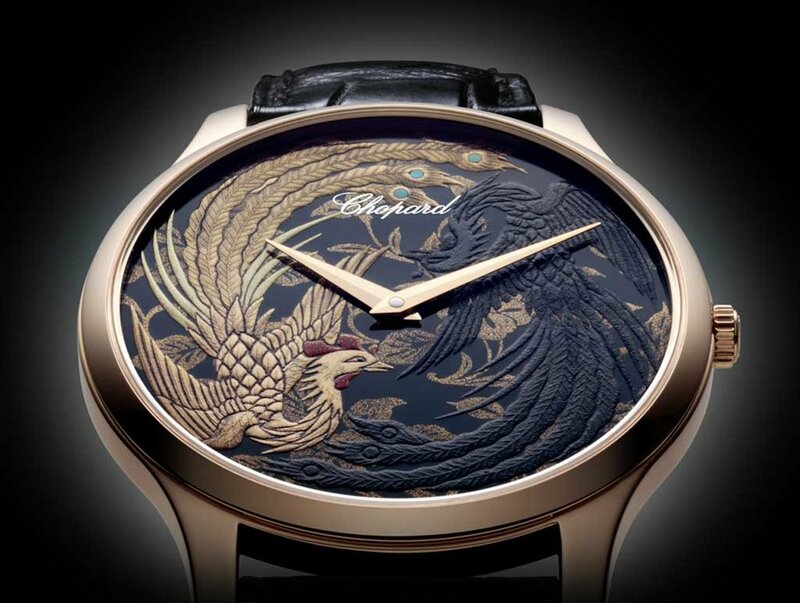 Van Cleef also released a limited edition of eight maki-e watches, “Midnight Extraordinary Japanese Lacquer,” inspired by traditional Japanese landscapes. Peter Speake-Marin, an independent watchmaker, has also, since 2007, been working primarily with a Japanese Maki-e artist, Muysu Yamazaki, who has crafted eight of these time-consuming faces for him. Other lacquer techniques are also being used on dials. Angular Momentum, a Swiss company that specializes in custom-made timepieces, started doing lacquer dials in 2004. Angular Momentum pieces done by Marin Pauli mainly use the taka-maki-e technique, lacquer decoration in bold reliefs, which is then mixed with other modern techniques and designs like guilloché or floral engraving. The company has also produced so-called tsuishu dials, where the lacquer is engraved. Since it works mainly with stainless steel watch cases, prices for the lacquer watches start relatively low, at around 12,000 Swiss francs, or about $12,000. A version of this article appears in print on November 26, 2010, in The International Herald Tribune.